Some of the shooting industry’s leading vendors teamed up with Crimson Trace to sponsor the Midnight 3 Gun Invitational event in Bend, OR. While I can’t cover all the new products displayed here, a few stood out. During daylight hours when shooting was not deemed challenging enough, we had the opportunity to talk guns, gear and new offerings from a dozen different companies. We’ve been big fans of the OTIS system longer than Barney Frank has been cheating on taxes. The big news for this fall is the OTIS Ripcord. Similar to the Bore Snake cleaners in only the most cursory of looks, the Ripcord brings a lot of improvements. The cleaners are semi-rigid and made of Nomex, so they are far more durable and a lot less likely to get caught in the receiver when pulling them through your rifle or pistols. The helix pattern serves both scrubbing and dirt gathering functions for thorough cleaning. Ripcords have threaded caps on both ends so you can attach a wire brush for extra cleaning power, or perhaps a solvent-soaked patch in front of the cleaner. Oh, and they’re heat-resistant to 700 degrees. They’ll be released this fall in .223/5.56mm, .308, 9mm, .40 and .45 ACP calibers. I suspect we’ll see that list grow. In the relatively new category is the OTIS MSR / AR-15 cleaning kit. Contained in one of the OTIS small zip cases, it contains everything you need for thorough AR cleaning. The B.O.N.E. Tool is beautifully designed to clean carbon gunk from the bolt carrier, bolt and firing pin. It’s especially handy for that impossible to clean bolt tail area. Lot’s of scrapers, brushes and picks help you reach all the other hard to access places in the AR rifle. Traveling with one gun is challenging enough. Traveling with three, and all the assorted gear for an event like this is a supreme test of logistics and packing skills. 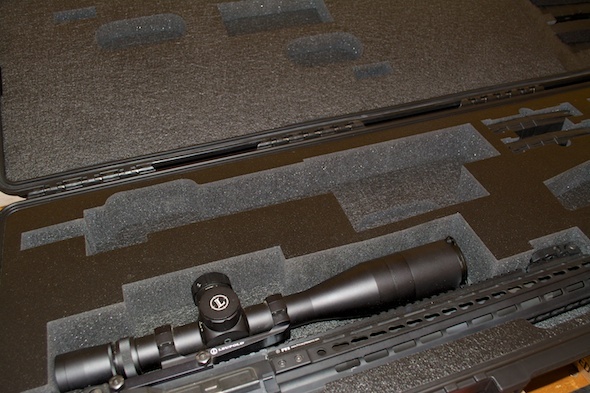 HH Bauer makes custom foam inserts for Pelican and other cases. 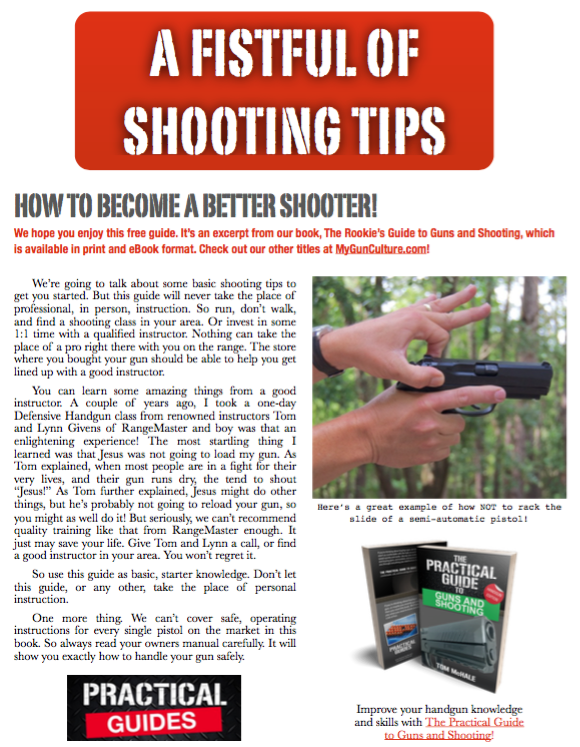 As a Pelican dealer, they can equip you with gun and gear cases to make the pros envious. Already got a case? No worries, they can whip you up custom inserts for your specific gear. 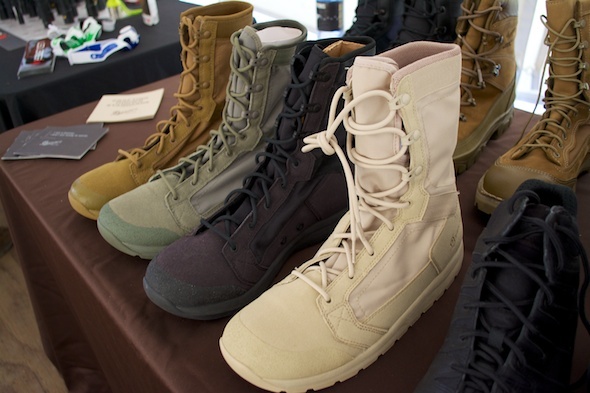 In addition to generously outfitting Media participants with Rivot TFX Hot Military boots for the event, Danner displayed a variety of their products in the vendor fair. The ones shown in the photo drew my attention, and when I picked them up, I quickly found they were anti-gravity boots! The Tachyon Hot Military boots are the lightest boots I’ve ever seen, bar none. Wow, it was pretty amazing. Want to go run some trails? Try these. MGM has a new line of .22 rimfire targets. The one that got my attention was the MGM .22 Rimfire Spinner Target. The idea is to hit top, bottom, or alternate between both to get the target to spin a complete 360. It will take multiple, perfect hits to succeed. It gets really challenging when the target starts rocking back and forth and you have to hit it on the move to increase the momentum. It’s more addictive than Reese’s Peanut Butter Cups. And that’s saying a lot. Want to burn through 1,000 rounds of .22LR? Get a Ruger 10/22 and one of these! I was able to shoot a Colt Competition with the new Warne RAMP mounting system. Two things stood out here. The shooting scenario had us taking a shot with one scope mounted in a Warne RAMP, then removing the mount and scope and replacing it with a different scope mounted in a different RAMP mount. The idea was point of impact repeatability. Yep, it worked like a champ. The second neat feature of this mount is the integrated 45 degree mounting rails. They are detachable, so you can use them on either side or both. 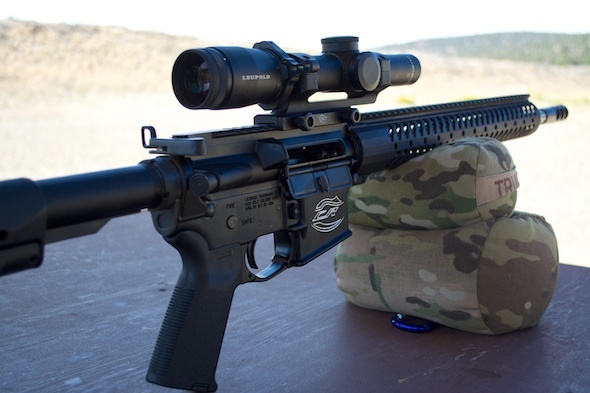 Mount a short-range optic like an iron sight or Trijicon RMR to complement your primary optic. Cool. Leatherman showed us a bunch of gear for all sorts of tasks, but I was particularly keen on the Leatherman Rail. Made specifically as an AR platform range tool, the Rail includes a sight adjustment tool, a pin punch, ⅜” wrench and bits and driver for rail, scope and other adjustment tasks. It also features and oxygen bottle wrench in case you get a little woozy at the range! Are you a shotgunner or bowhunter? 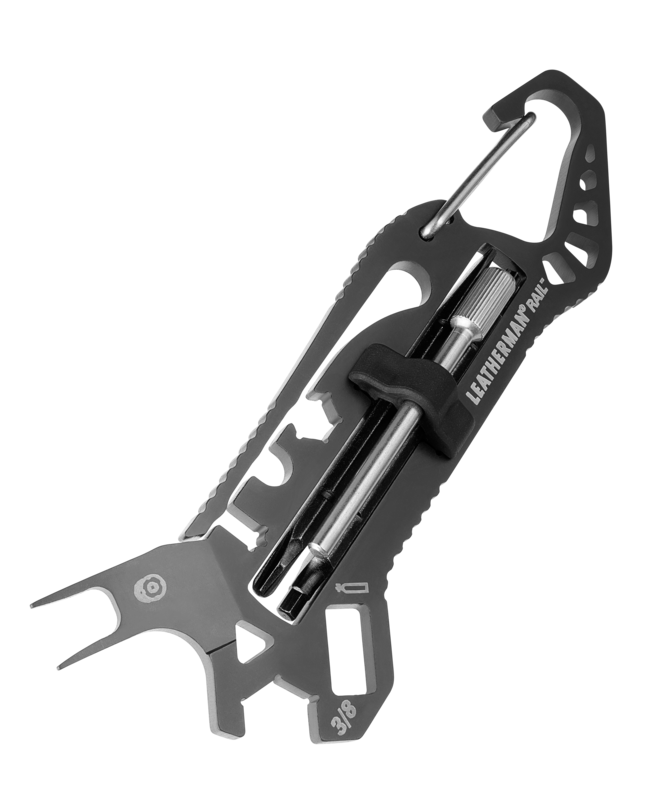 No worries, check out the similar Leatherman Pump and Cam tools for those platforms. We saw these at SHOT Show and wow they are sweet, sweet AR rifles. You can count on somewhere in the ½ MOA accuracy range. I shot a .223 at a 500 yard gong with great success. Check them out at your earliest opportunity! We we able to test out the Crimson Trace MVF-515 vertical fore grip for rail-equipped rifles. This unit features a green laser and a 200 lumen light. Pressure pads on both sides of the foregrip allow you to control light and laser independently. Wow! The stability of the laser on a rifle, combined with the strong light, allows amazingly fast target acquisition and aiming. I was shocked at how effectively I was able to shoot a rifle in zero light conditions.